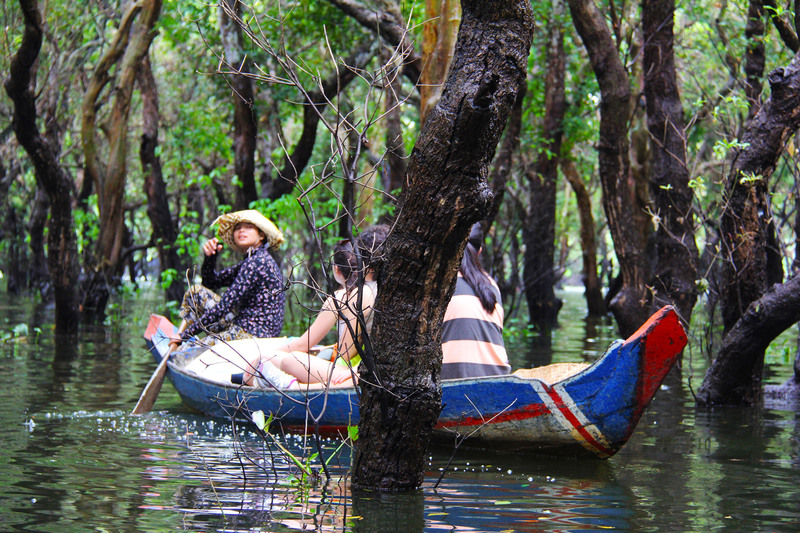 When is the Best Time of Year to visit Kompong Phluk? As you may know, Kompong Phluk is located on the banks of the Tonle Sap Lake. The Tonle Sap is connected to the Mekong, a unique river connecting much of Southeast Asia whose current changes direction based on the monsoon season. During the raining season (June to October), the lake fills with water flowing from the northward-flowing Mekong River. It can expand to over 12,000 square kilometers. In the dry season, which begins the second week of November and continues until May, water changes course and slowly leaves the floating village. At its lowest point water depth decreases from 10+ meters to 1+ meter (90% reduction) and 12,000+ square kilometers to 2000+ (600% reduction). This massive movement of water inwards and outwards is one of the reasons why tours of Kompong Phluk have slight logistical changes based on the season. It also means that the flooded mangrove forest is closed part of the year. During the rainy season, the water will be higher. This means travel time (via tuk-tuk, car, etc.) is less and the boat ride in the village is longer. This is because the Tonle Sap has expanded and gotten closer to Road 6. The stilted homes will also not appear to be as high, and it is difficult to do walking tours as there are no exposed lands. You are still able to see mangroves, but they don’t appear as high. During the dry season, your commute to the village can be slightly longer. The boat ride will be slightly shorter as well. That being said you will still take a boat through the stilted village. Another beautiful thing about this time of year as it’s possible to do more extended walking tours of the village and see the base of the home stilts. You are still able to see mangroves as well, but you have to go further out. In addition, the flooded forest is usually closed for a few weeks in April as there is no water. So, back to the question: When is the best time of year to visit Kompong Phluk? The answer is: it’s always a good time of year! While there are changes regarding transport to the village, the experience in Kompong Phluk itself is somewhat consistent. Whether it’s rainy season or dry season, you still take a boat ride, see stilted and floating homes, and see the Tonle Sap. That being said, there are a few weeks when the flooded forest is not visitable. If you have questions about water levels or itineraries feel free to email us. We are happy to go into more detail on what to expect.